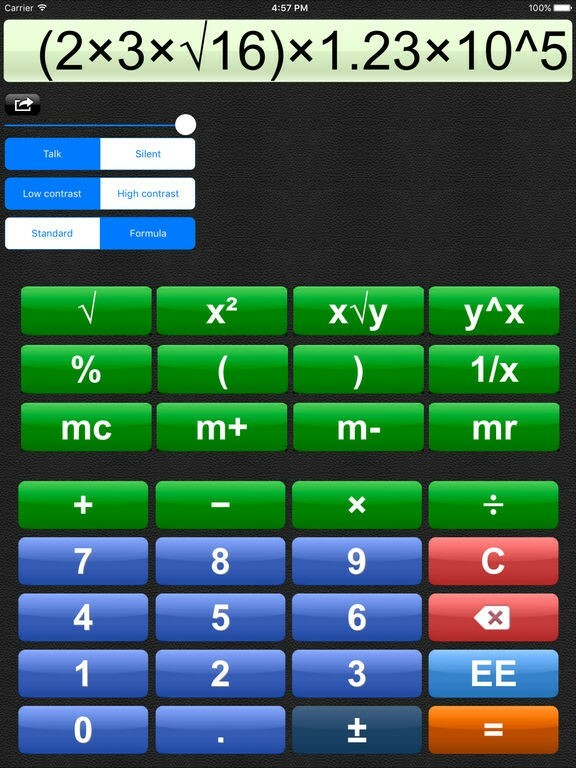 Talking Calculator is a mathematical app for iOS products. By clicking on any of the calculator functions, the app will say aloud the full value of what is currently on the screen. It updates the spoken term as you type, so it won’t be saying the wrong number! Symbols, such as “=” (or “equal”) are spoken aloud as well. The app will even read out the final answer! There is also a volume adjuster in the app which is separate from the device’s audio settings. The app can speak in your own voice, in the voice of someone you’ve recorded, or in the pre-downloaded voice! There are two general layouts: a default layout, which looks like the above image, and a simplified layout. The simplified layout has larger buttons and only operators and numbers on the screen. Additionally, there are also two different color settings: the Low Contrast setting (shown in the picture above), and the High Contrast setting (which has a yellow background with black buttons). This Talking Calculator can add, subtract, multiply, and divide, just like a normal calculator. It also can use exponents and take the square root of a number. If you want to learn more, check out Talking Calculator by Adam Croser for iOS here. If you are looking for a talking calculator with more features, you should check out the iOS app Talking Scientific Calculator by Adam Croser. A similar Android version of Talking Calculator by Sanjeev Neupane is also available. The Talking Calculator iOS version is $1.99. The Talking Scientific Calculator for iOS is $4.99, and acts like a full scientific calculator. The Talking Calculator Android app is free to download. This entry was posted in Tech Blog and tagged Android, App of the Week, Assistive Technology, CSDTech, iOS, Math, Mobile Devices, Productivity.